Sunday January 19th 1896 I was busy about the house all morning as it was late when we got up and I wanted dinner early. We went over home for a visit in the afternoon. I read and wrote in the evening. A fine winter day. Monday January 20th 1896 It was a fine day. Will helped me wash and churn before noon. I had all my other work done so that after an early dinner we went down town. I spent part of the afternoon at Mrs. Rick and called at Lathrops where Will called for me. I finished my rug tonight. Tuesday January 21st 1896 Another grand day. I got ironing done and dinner ready early and we went in town. I put in the afternoon making calls on Summit St. Will found me at Luca's. I got the supper in short order and Seth went back to town with us. Will took me over home. I found Father and Mother gone to the valley. Wednesday January 22nd 1896 I did mending and baking this morning. Went to town early in the afternoon after doing some errands went up to the church to Aid society. It rained in the evening or we would have gone in town again. 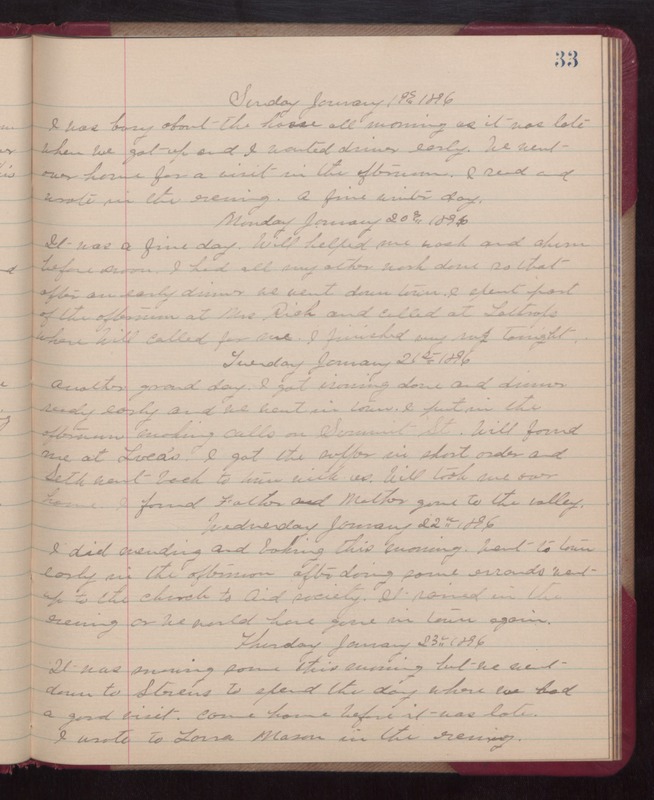 Thursday January 23rd 1896 It was snowing some this morning but we went down to Stevens to spend the day where we had a good visit. Came home before it was late. I wrote to Laura Mason in the evening.